The 100 rooms & suites comprise elegant and luxurious touches. All bedrooms are tastefully designed with stylish en-suite bathrooms and rain showers, accented with luxury toiletries. 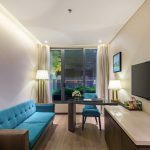 The room features include LCD flat-screen televisions, Wi-Fi and broadband Internet access, telephone and a selection of international satellite television channels, single sofa and reading desk.